As of this writing, we have about 56 thousand hits. That’s only 7 and a half million fewer than that cat on a roomba. 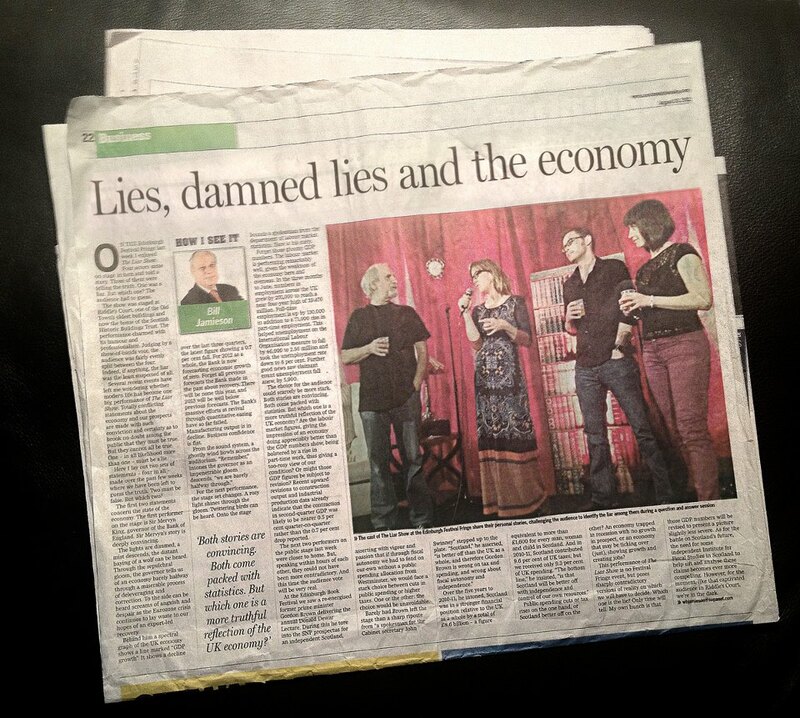 I also performed with The Liar Show at the Fringe Festival in Edinburgh, where we made it into the Sunday Scotsman, above the fold. And so that was 2012. Thanks for watching. …on May 21st. The same day the world was supposed to end. I’m not jumping to conclusions. Manservant is kind of awesome. So for the first time in ages, I went out and bought an actual physical newspaper. Okay, ten actual physical newspapers. It was great to make it into print, but I couldn’t help but notice one glaring oversight: David Dickerson told far and away the best story of the night, about his adventure skinny-dipping in Red Tide. It was funny, exhilarating and – like the best stories – really, genuinely moving. I can only guess that the reporter was in the loo at the time. Brad Lawrence puts on an amazing show. I’ve said that before, but this time, there’s proof! Download the The Standard Issues episode from 2/23 to hear our inaugural attempt at relay storytelling. A Domino Effect, if you will. Right now, I should be working on the story I’m telling at tomorrow night’s How I Learned. But, I’m a bit of a procrastinator. So instead, I’ll write about how swell the How I Learned series is. Our host, the lovely Blaise Allysen Kearsley, has a knack for lining up the perfect blend of writers: the hilarious, the sincere, and my favorite, the hilariously sincere. She also knows how to pack the joint, so get there early. On October 10th, the kids’ network I’d been working on for months made its worldwide debut. 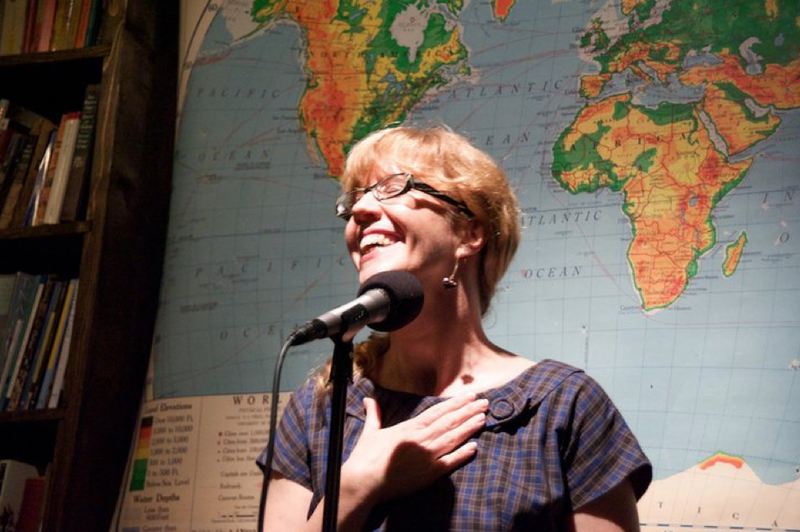 The following night, I performed in the LA Moth GrandSLAM. So, not a whole lot of prep time on this one. The theme was “Without a Net,” which I ended up taking literally. And I knew that I couldn’t tell a story onstage in Los Angeles without including David Pincus: a beloved friend and natural storyteller. One of the mob’s less-intimidating threats. And a story that won the Los Angeles Slam in August, probably because the judges were all like, “yeah, the same thing once happened to me.” It’s all about being relatable.